Born on this date in 1887 in rural Humbolt, Kansas, the side-arming right-hander won 417 games in his 21-year career, all of it with the Washington Senators. Below is a look at Johnson’s life, career and legacy in 10 bullet points. Walter Johnson left with his family in 1902 for the booming oil economy in southern California. He graduated from Fullerton Union High School in Orange County. The prep phenom once struck out 27 batters in a 15-inning game against Santa Ana High School. Johnson played semi-pro ball in California and in Weiser, Idaho. He went 14-2 with a 0.55 ERA in his second season in Idaho. A scout for the Washington Senators discovered and signed the so-called “Weiser Wonder” in 1907. It didn’t take long for Johnson to see some action with the big club. He finished just 5-9 as a 19-year-old rookie with the Senators in 1907 but had a sparkling 1.88 ERA (129 ERA+). In his first 10 seasons, Johnson had just one with an ERA above 2.00 (2.22 in 1909). In 1910, he went 25-17 with a 1.36 ERA (183 ERA+) and led the American League in starts (42), complete games (38), innings pitched (370) and strikeouts (313). The Big Train enjoyed his best season in 1913. He finished 36-7 with a 1.14 ERA (259 ERA+). He threw 11 shutouts and posted a 14.6 WAR. Not surprisingly, Washington’s ace won the MVP. Johnson won at least 20 games every season from 1910-19. He had seven seasons with WARs above 10.0. The Big Train ranks first all-time among pitchers with 152.3 WAR points. Arguably the greatest pitcher ever finished with a 417-279 won-loss record (.599 percentage) and a 2.17 ERA. He struck out 3,509 batters and threw a record 110 shutouts. He posted a career ERA+ of 147. Baseball-Reference.com features a stat called Black Ink Points. If a player leads the league in a category, he gets a Blank Ink point. Johnson has 150 points, more than any other pitcher. Bill James uses a formula he uses called the Hall of Fame monitor. Basically, it judges a player’s worthiness for selection to Cooperstown. Johnson has 364 points, tops among pitchers. 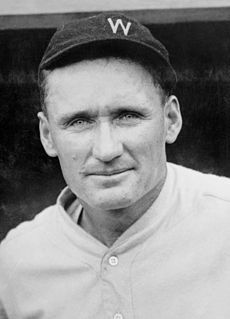 Following the 1927 season, Johnson retired. He managed Newark of the International League for one season and then skippered the Senators from 1929-32. Johnson also managed the Cleveland Indians from 1933-35. Although criticized for his laid-back style, the great pitcher had a .550 winning percentage as a manager. He spent his last years on a farm in Montgomery, Md., and died of a brain tumor Dec. 10, 1946, at age 59. Walter Johnson High School opened in 1956 in Bethesda, Md. Newsweek named it one of “America’s Best High Schools” in 2013. Aspiring journalists write for the school newspaper, The Pitch; student-athletes compete for the Wildcats. (Really? Not the Big Trains? Missed opportunity.) ESPN’s Tim Kurkjian is a Walter Johnson H.S. alum.